This day event is about learning to trust the temple of one’s being. Through the use of body awareness, breathing, movement and dance, the life force constantly moving inside can be drawn upon to come home, into simple presence in the here and now. 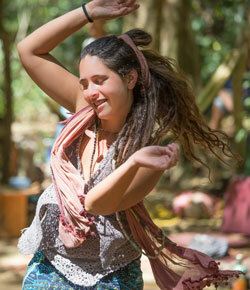 Some of the techniques used include: learning to ground one’s energy and embody awareness, breathing exercises to ignite the inner fire, moving to different types of rhythms, and free flowing dance to connect to the playfulness, aliveness and joy of expressing through the body. No previous dance experience is required for this workshop. All one needs is willingness, curiosity, and a desire to move and be moved.